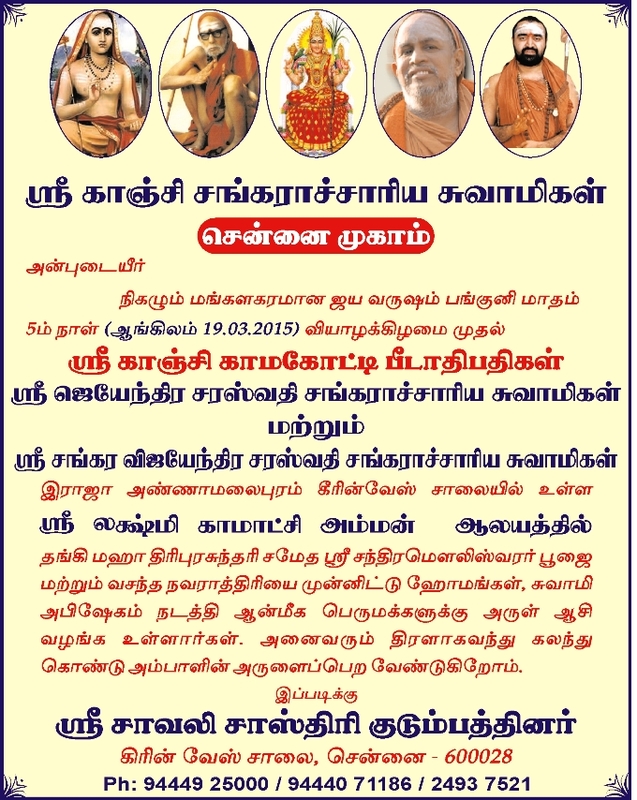 Shrimatam camp will be held at Sri Lakshmi-Kamakshi Temple in Greenways Road, Raja Annamalaipuram, Chennai from 19 March 2015(Tamil Month Panguni - 5th day). Their Holinesses Pujyashri Jayendra Saraswathi Shankaracharya Swamiji and Pujyashri Shankara Vijayendra Saraswathi Shankaracharya Swamiji will observe the Vasanta Navaratri from 21 March 2015. The Nitya Sri Mahatripurasundari Sameta Sri Chandramouleeswara Swamy Puja will be performed by His Holiness.